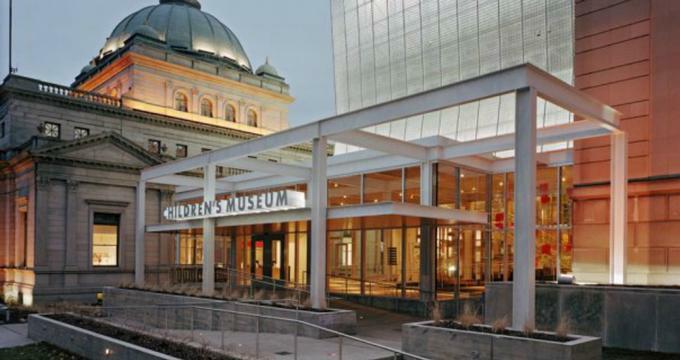 Located in Pittsburgh, the Children’s Museum of Pittsburgh is an interactive museum that has been named one of America’s top children’s museums by Parents magazine. The museum’s roots can be traced to a traveling exhibit that originated as part of the 1972 Three Rivers Arts Festival, an annual summer music and arts festival in Pittsburgh. During the 1970s, the trend of establishing children’s museums spread across American cities, and in 1983, a permanent home for the traveling mobile museum was founded inside the former Allegheny Post Office building in the city’s North Side. In the early 2000s, the museum’s facility expanded into the neighboring Buhl Planetarium building, which closed in 1991 as a result of the opening of the nearby Carnegie Science Center. A recipient of the American Institute of Architects’ National Honor Award for Architecture, the facility is noted for its unique architecture, which combines two historic buildings into a LEED-certified green campus. Recent grounds renovations have revitalized the park space surrounding the campus, including the 2012 installation of a fog sculpture and a playscape by Ned Kahn located immediately in front of the museum. The museum attracts more than 250,000 annual visitors, presenting a wide variety of programming and exhibits to engage children with history, science, and the arts. Local legend Fred Rogers, host of the popular PBS series Mister Rogers’ Neighborhood, is honored in the Fred Rogers and Us exhibit, which has served as the museum’s flagship exhibit since its opening. The exhibit showcases original puppets featured on the program, including King Friday, X the Owl, and Lady Elaine Fairchild, as well as the iconic sweater and sneakers worn by Rogers during broadcasts. Until 2015, the exhibit also featured the original King Friday’s Castle and Neighborhood Trolley props from the show. Several past incarnations of the exhibit continue to tour children’s museums across the country, including one given as a gift to the Louisiana Children’s Museum after Hurricane Katrina. The MAKESHOP® engineering workshop allows children to use real tools and crafting materials to work on a variety of woodworking, circuitry, textile, animation, and digital media projects. Local crafters, artisans, and inventors present workshops in the space, encouraging open-ended creativity and innovation. In the Attic, children can maneuver the Gravity Room with floors tilted at a 25-degree angle, capture shadows in the Phosphorescent Room, and create custom puppet shows in the Animateering exhibit, developed in conjunction with Carnegie Mellon University. The exhibit features a number of notable art pieces, including several works by Andy Warhol and the original urSol the Chanter puppet from Jim Henson’s The Dark Crystal. A Garage inside the Buhl Planetarium building encourages children to drive, roll, and fly with exhibits that focus on motion and momentum, including a real SmartforTwo car. The waterplay exhibit features more than 20 fountains, pumps, and water activities, teaching children about the principles of hydraulics and buoyancy. An interactive theater uses refurbished planetarium seats to house audiences for all-ages interactive performances, and an art studio offers free multimedia play and guided workshops with artists in residence. The museum’s youngest visitors can play inside the sustainability-focused safe playspace Nursery, featuring a quiet area for reading. Outside the museum, the Backyard playspace features an interactive lookout clubhouse, a musical swingset, and a solar-powered music panel. An outdoor garden in front of the museum grows a variety of fruits, vegetables, and plants, offering seasonal programs on gardening and composting. The Children’s Museum serves as the mid-Atlantic hub for the Making Spaces: Expanding Maker Education Across the Nation initiative, co-sponsored by Google and Maker Ed. The initiative comes out of a 2015–2016 run of a museum-led program series with 10 schools in the southwestern Pennsylvania area, providing maker education, workshops, and resources to students. The Making Spaces initiative pairs community museums, libraries, and organizations with schools to help them create their own permanent maker spaces via crowdfunding campaigns. Also reflecting the museum’s commitment to maker education is the Maker Educator Boot Camp, hosted at the MAKESHOP® workshop. The 4-day professional development courses work with area teachers, educators, and museum professionals to explore unique approaches to bringing maker education to children. In addition to themed summer camps and field trip opportunities for local students, the museum also offers a variety of workshops led by museum educators. Participants can explore principles of electronics, engineering, nature, and the arts with guided hands-on activities. Periodic youth outreach initiatives, such as the Scaling the Walls cultural exchange with Quito, Ecuador, and the Food City Fellows summer program, utilize the museum’s gardens to teach principles of natural conservation and civic responsibility.